Father! thou didst, from thy early youth, separate thyself from all human society, and wast the first to live in the desert, surpassing all other Anchorets. Thou, Paul, didst pass thy whole life unknown to men; therefore was Anthony divinely inspired to go in search, of thee, as the hidden Saint; he found thee and revealed thee to the whole earth. O God, who comfortest us by the yearly solemnity of blessed Paul, thy Confessor; mercifully grant that while we celebrate his feast, we may imitate his actions. Through our Lord Jesus Christ, thy Son, who liveth and reigneth with thee, in the unity of the Holy Ghost, God, world without end. Amen. Inflamed with the heat of divine love, thou didst abandon human affections, and, Angel-like, didst spend thy life in the persevering search after more perfect things. To-day, the Church honours the memory of one of those men, who were expressly chosen by God to represent the sublime detachment from all things, which was taught to the world by the example of the Son of God, born in a Cave, at Bethlehem. Paul the Hermit so prized the poverty of his Divine Master, that he fled to the desert, where he could find nothing to possess and nothing to covet. He had a mere cavern for his dwelling; a palm-tree provided him with food and clothing; a fountain gave him wherewith to quench his thirst; and heaven sent him his only luxury, a loaf of bread brought to him daily by a crow. For sixty years did Paul thus serve, in poverty, and in solitude, that God, who was denied a dwelling on the earth he came to redeem, and could have but a poor Stable wherein to be born. But God dwelt with Paul in his cavern; and in him began the Anchorites, that sublime race of men, who, the better to enjoy the company of their God, denied themselves, not only the society, but the very sight, of men. They were the Angels of earth, in whom God showed forth, for the instruction of the rest of men, that he is powerful enough, and rich enough, to supply the wants of his creatures, who, indeed, have nothing but what they have from Him. The Hermit, or Anchoret, is a prodigy in the Church, and it behoves us to glorify the God who has produced it. We ought to be filled with astonishment and gratitude, at seeing how the Mystery of a God made Flesh, has so elevated our human nature, as to inspire a contempt and abandonment of those earthly goods, which heretofore had been so eagerly sought after. The two names, Paul and Anthony [of Egypt; Jan 17th], are not to be separated; they are the two Apostles of the Desert; both are Fathers—Paul of Anchorites, and Anthony [of Egypt] of Cenobites; the two families are sisters, and both have the same source, the Mystery of Bethlehem. The sacred Cycle of the Church's year unites, with only a day between their two Feasts, these two faithful disciples of Jesus in his Crib. The Church reads in her Office, the following abridgment of St. Paul's wonderful Life. Paul, the institutor and master of Hermits, was born in Lower Thebais. He lost his parents when he was fifteen years of age. Not long after that, in order to escape the persecution of Decius and Valerian, and to serve God the more freely, he withdrew into the desert, where he made a cave his dwelling. A palm-tree afforded him food and raiment, and there he lived to the age of a hundred and thirteen. About that time, he received a visit from Anthony [of Egypt], who was ninety-years old. God bade him visit Paul. The two Saints, though they had not previously known each other, saluted each other by their names. Whilst holding a long conversation on the kingdom of God, a crow, which every day brought half a loaf of bread, carried them a whole one. When the crow had left them, Paul said: “See! our truly good and truly merciful Lord has sent us our repast. For sixty years, I have daily received a half loaf; now, because thou art come to see me, Christ has doubled the portion for his soldiers.” Wherefore, they sat near the fountain, and, giving thanks, they eat the bread; and when they were refreshed, they again returned the accustomed thanks to God, and spent the night in the divine praises. At daybreak, Paul tells Anthony of his approaching death, and begs him go and bring the cloak, which Athanasius had given him, and wrap his corpse in it. As Anthony was returning from his cell, he saw Paul's soul going up into heaven, amidst choirs of Angels, and a throng of Prophets and Apostles. When he had reached the hermit's cell, he found the lifeless body: the knees were bent, the head erect, and the hands stretched out and raised towards heaven. He wrapped it in the cloak, and sang hymns and psalms over it, according to the custom prescribed by Christian tradition. Not having a hoe wherewith to make a grave, two lions came at a rapid pace from the interior of the desert, and stood over the body of the venerable Saint, showing how, in their own way, they lamented his death. They began to tear up the earth with their feet, and seemed to strive to outdo each other in the work, until they had made a hole large enough to receive the body of a man. When they had gone, Anthony carried the holy corpse to the place, and covering it with the soil, he arranged the grave after the manner of the Christians. As to the tunic, which Paul had woven for himself out of palm-leaves, as baskets are usually made, Anthony took it away with him, and, as long as he lived, wore it on the great days of Easter and Pentecost. 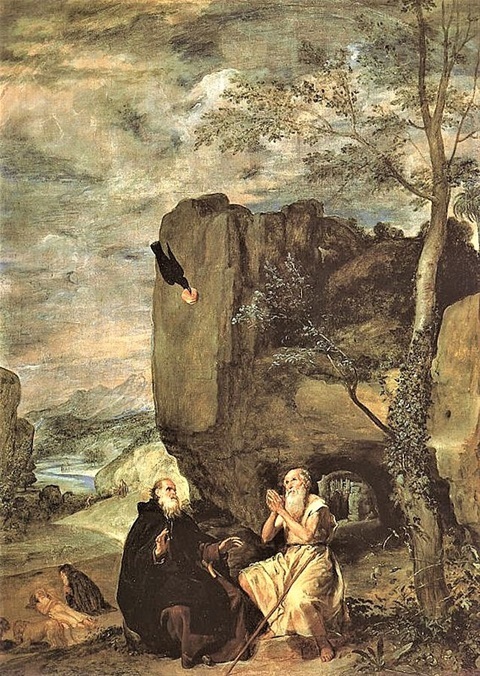 Another account of St. Paul, the First Hermit. Elias and St. John the Baptist sanctified the deserts, and Jesus Christ himself was a model of the eremitical state during his forty days' fast in the wilderness; neither is it to be questioned hut the Holy Ghost conducted the saint of this day, though young, into the desert, and was to him an instructor there; but it is no less certain, that an entire solitude and total sequestration of one’s self from human society, is one of those extraordinary ways by which God leads souls to himself, and is more worthy of our admiration, than calculated for imitation and practice: it is a state which ought only to be embraced by such as are already well experienced in the practices of virtue and contemplation, and who can resist sloth and other temptations, lest, instead of being a help, it prove a snare and stumbling-block in their way to heaven. This saint was a native of the Lower Thebais, in Egypt, and had lost both his parents when he was but fifteen years of age: nevertheless, he was a great proficient in the Greek and Egyptian learning, was mild and modest, and feared God from his earliest youth. The bloody persecution of Decius disturbed the peace of the church in 250; and what was most dreadful, Satan, by his ministers, sought not so much to kill the bodies, as by subtle artifices and tedious tortures to destroy the souls of men. Two instances are sufficient to show his malice in this respect: A soldier of Christ, who had already triumphed over the racks and tortures, had his whole body rubbed over with honey, and was then laid on his back in the sun, with his hands tied behind him, that the flies and wasps, which are quite intolerable in hot countries, might torment and gall him with their stints. Another was bound with silk cords on a bed of down, in a delightful garden, where a lascivious woman was employed to entice him to sin; the martyr, sensible of his danger, bit of part of his tongue and spit it in her face, that the horror of such an action might put her to flight, and the smart occasioned by it be a means to prevent, in his own heart, any manner of consent to carnal pleasure. During these times of danger, Paul kept himself concealed in the house of another; but finding that a brother-in-law was inclined to betray him, that he might enjoy his estate, he fled into the deserts. There he found many spacious caverns in a rock, which were said to have been the retreat of money-coiners in the days of Cleopatra, queen of Egypt. He chose for his dwelling a cave in this place, near which were a palm-tree and a clear spring, the former by its leaves furnished him with raiment and by its fruit with food; and the latter supplied him with water for his drink. An eminent contemplative draws the following portraiture of this great model of an eremitical life: St. Paul, the hermit, not being called by God to the external duties of an active life, remained alone, conversing only with God, in a vast wilderness, for the space of near a hundred years, ignorant of all that passed in the world, both the progress of sciences, the establishment of religion, and the revolutions of states and empires; indifferent even as to those things without which he could not live, as the air which he breathed, the water he drank, and the miraculous bread with which he supported life. What did he do? say the inhabitants of this busy world, who think they could not live without being in a perpetual hurry of restless projects; what was his employment all this while? Alas! ought we not rather to put this question to them; what are you doing while you are not taken up in doing the Will of God, which occupies the heavens and the earth in all their motions? Do you call that doing nothing which is the great end God proposed to himself in giving us a being, that is, to be employed in contemplating, adoring, and praising him? Is it to be idle and useless in the world to be entirely taken up in that which is the eternal occupation of God himself, and of the blessed inhabitants of heaven? What employment is better, more just, more sublime, or more advantageous than this, when done in suitable circumstances? To be employed in any thing else, how great or noble soever it may appear in the eyes of men, unless it be referred to God, and be the accomplishment of his holy will, who in all our actions demands our heart more than our hand, what is it, but to turn ourselves away from our end, to lose our time, and voluntarily to return again to that state of nothing out of which we were formed, or rather into a far worse state? Also read – January 15, 2019: St. Maurus, Abbot. St. Paul, the First Hermit, pray for us.